Congratulations to the recent winners. Lee Child's Gone Tomorrow will go to Cindi H. from Edwardsville, IL. I'll be sending Chelsea Cain's Heartsick to Tawnda M. from East Greenville, PA . And, Ingrid K. won Mariah Stewart's Home Again. I'll be mailing the Child and Cain books, and Mariah Stewart's publisher will send out that book. This week, I'm featuring two recent blockbuster novels, with similar themes. As Laura Lippman's victim said, when asked how she was rescued, she almost answered, "I'm not sure I was." That could be the answer in both books. 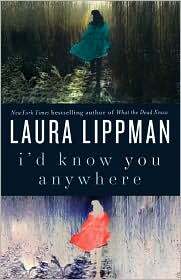 Laura Lippman's I'd Know You Anywhere is about a woman who had been kidnapped when she fifteen, and held hostage for six weeks. When her kidnapper contacts her from death row, she wants to know why he let her live when other girls were killed. I'd Know You Anywhere is one of the best of Lippman's books. 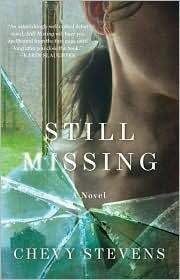 Or you could win Chevy Stevens' debut novel, Still Missing. Annie O'Sullivan was abducted when the thirty-two-year-old realtor was working an open house. Held captive for a year, she relives her experience through sessions with her psychiatrist. That nightmare is entwined with the nightmare that actually followed her escape, as she tries to put her life back together. So, which novel would you like to win, I'd Know You Anywhere or Still Missing? You can enter to win both, but I need separate entries. Email me at lholstine@yahoo.com. Your subject line should read either "Win I'd Know You Anywhere" or "Win Still Missing." Your message should include your mailing address. Entrants only in the U.S., please. The contest will end Thursday, Sept. 30 at 6 p.m. PT. The winners will be selected by random number generator. I'll notify the winners and mail the books the next day. Good luck! GREAT choices Lesa, and such a compelling theme for a book, I think. I feel like child-missing stories toe a very fine line between pulse-pounding suspense and "I just can't look"--for me anyway. It's interesting that these two authors chose to see the victims safely into adulthood before the story started. They both look terrific, and I'll send e-mails for both. I explored this theme in my latest Detective Jackson story, Thrilled to Death. I think it's many women's greatest fear. Janny, I think you're right. It gave the reader that reassurance that the victim survived, but the suspense lies in, did they really survive. L.J. - And, I have Thrilled to Death here, and, hopefully, I'll get to it soon. Good luck with the contests!